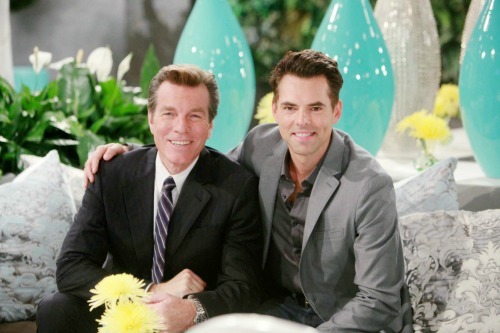 The Young and the Restless (Y&R) spoilers tease that Billy (Jason Thompson) will continue his efforts to win Phyllis (Gina Tognoni) back. He has no intention of giving up on the woman he loves. However, Phyllis has had a hard time forgiving Billy for his mistakes. She’s starting to worry that their relationship will always bring more drama. Sexual attraction obviously isn’t a problem for Billy and Phyllis, but that’s not enough to keep a romance going strong. If they want to have a future together, they need to able to work through their issues. Is that a real possibility for these two? They could find common ground and move forward, but it’s going to take a lot of work. Of course, Billy may have some competition soon. After the “Philly” affair, Phyllis fought to repair her marriage to Jack (Peter Bergman). Since he was too angry to even consider it, their relationship came to and end and Phyllis eventually got together with Billy. Now that Jack’s on good terms with both of them, things could be changing. Wednesday’s episode definitely drops a hint about Phyllis and Jack’s lingering connection. It’s clear that there’s still something between them. Will Y&R run with that? Phyllis is feeling unsure about Billy, so maybe a reunion with Jack is still possible. That could reignite the Abbott brother battle if they’re not careful. Billy wouldn’t really have a right to complain since he broke “Phack” up in the first place. He probably wouldn’t see it that way though – at least not at first. Billy might accuse Jack of putting on a reconciliation show and then stabbing him in the back. Billy would fight for Phyllis, but it would have to be her choice in the end. If both Billy and Jack become options, which one will she pick? Some Young and the Restless spoilers are pointing in Jack and Phyllis’ direction, but nothing’s set in stone. Mal Young, Y&R’s head writer and executive producer, seems to like Billy and Phyllis as a pairing. That’s something to keep in mind as this plot moves forward. Phyllis and Jack’s reconnection may not stick, but the love triangle’s worth pursuing. Who do you think Phyllis belongs with? Should she be with Billy, Jack or swear off the Abbott brothers entirely? We’ll give you updates as other Young and the Restless news comes in. Stay tuned to the CBS soap and don’t forget to check CDL often for the latest Young and the Restless spoilers, updates and news. Who Will Phyllis Choose – Jack or Billy?